This is an image I like. The sculpture of the man and someone that looks like he could have been the model. Perhaps that's Erwin Wurm himself. This piece had a price tag of €85,000. The sculpture of the woman posing with the exagerated perspective is something that you normally see only in paintings or illustrations for comics. It's the first time I've ever seen the like in a 3D object. It works. Wang Du made several of these which were on exhibition. Interestingly most of the sculptures are cast in resin, making multiple copies possible. But it also suggests that most people accept that plastics are more stable than bronze and will last for hundreds of years. Bad for the environment but good for art. Today and yesterday I visited the work on show at FIAC. 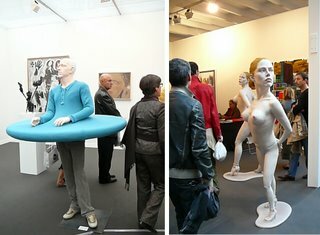 The contemporary art fair held once a year in Paris. To my surprise, I really enjoyed it. There was a lot of very good work. Some was surprising and there definately seems to be a two tiered system at work. 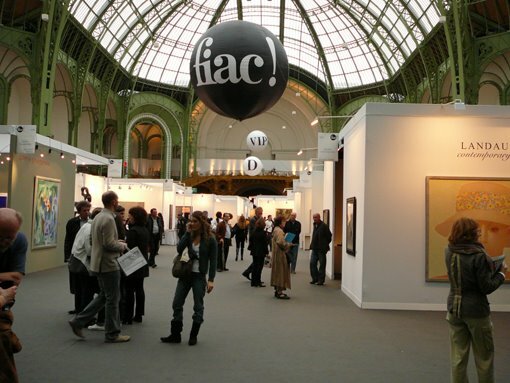 In the FIAC Louvre exhibition the work is not so dynamic, if at all. The impression you get is a mix of student work and pretty good images or sculpture. It wasn't really impressive and almost put me off visiting the FIAC at the Grand Palais. I did enjoy the buzz at the Louvre though. There was some really bad, cheap looking, shock orientated/attempted stuff there. Bit sad. The Grand Palais was a completely different affair. The Palais itself is an amazing building. So the setting was perfect for this event. As I entered the first thing I was drawn to was an exhibition of paintings in the gallery Landau (to the right in the photo). It has contemporary work with feet firmly planted in classical. Sometimes painting mixed with photography. Other pieces of glass sculpture which are abstract and interesting. The rest of the galleries had very impressive work too. Some excellent combinations of sculpture and painting to create optical illusions, others with very daring pieces of art. Observing the body language of dealers was especially interesting. Some seemed to be almost like accountants, dressed in suits and lost in their computers, calculating the value of the work based on the insecurity of the stockmarket. Others were genuinely relaxed and aware, very human with the people they encountered. Particularly the Parisian galleries. I was impressed by the dealers and the work they had on display. Everything from latex abstract sculptures to beautiful portraits and digital prints (going for enormous amounts of money). It was a very worth while two days of exploration. I'll post more photos, perhaps. It went well. I've had my day in the Louvre. It was stressful but there was a very good attendance. Though I didn't enjoy it one bit. I was totally stressed beforehand and the space was so huge that everyone felt lost there. There were 20 artists and a huge amount of space between each one. It was part of the rules and regulations that we not cause a crowd or block exists etc so we had to be very spaced out. It looks great great on a CV. Here are some details of upcoming events. If you would like more information please get in contact. January 2007: France, Montreuil, 93100 Opening Life Drawing school. Monday & Wednesday evenings and Saturday mornings. January 2007: I am teaching a two weekend long course on exercising the left, creative hemisphere, of the brain. If you are in Paris and would like further information on any of the above courses please send an email to soilsiu@yahoo.com with the name of the course in the title, your name and contact details.